September 13, 1941 Image Size: 26 1/2" x 15 1/2"
Salerno was one of the bloodier, more critical operations of the Second World War. For a time the action hung in the balance as strong enemy counterattacks smashed and threatened the very existence of the initial beachhead. This was the opening struggle of the long and bitter Italian campaign. The Fifth Army held the beachhead at Salerno for four days but were danger of losing it to advancing German assaults and needed assistance quick. The only choice was to utilize the 504th Parachute Infantry Regiment, which had been performing mock assaults, in an effort to provide relief to the dwindling forces of the Fifth Army. On September 13, 1943 1st and 2nd Battalions were alerted that they would be performing a parachute assault. "Another dry run", was the cynical comment of most men. Nevertheless, each man gave his equipment a last minute check - just in case. Early chow was eaten and immediately afterward the troops fell in at their bivouac areas in the appointed plane loading formations; then marched to the battered and roofless hangars where they picked up their chutes. The first troopers to board planes were the Pathfinders of the 504th who would be establishing and mark the drop zone which was located in the middle of the Fifth Army. These men devised a plan to mark the drop zone with a flaming “T” using sand and gasoline. While the Pathfinders were on their way to the fight, the rest of 1st and 2nd Battalion were hard at work. Officers were checking maps and information to decipher the best course of action to help save the Fifth Army and save the beachhead. Noncommissioned officers had soldiers hard at work issuing parachutes, performing maintenance checks on weapons, and starting to load planes. None of these paratroopers knew the location of this jump or what type of fighting was expected. It was not until the men were seated in the planes that the mission was disclosed. In probably the quickest briefing of any comparable operation of the war, men of the 504th were informed that the Fifth Army beachhead in Italy was in grave danger of being breached and that the 504th was to jump behind friendly lines in the vicinity of the threatened breakthrough in order to stem the German advance. Under the cover of darkness the planes left for the beachhead. Flying in a column formation they passed over the clearly marked DZ and unloaded their much needed support. With the exception of eight planes which failed to navigate properly to the DZ, but whose planeloads were subsequently accounted for, there was little difficulty or confusion experienced in completing the operation. The regiment assembled quickly and moved to the sounds of cannon and small arms fire within the hour. Later checks revealed that, amazingly, only 75 men had suffered injuries as a result of the jump. In exactly eight hours the 504th had been notified of its mission, briefed, loaded into planes, jumped on its assigned drop zone, and committed against the enemy. By dawn the regiment was firmly emplaced in a defensive sector three miles from Paestum and Southwest of Albanella. The days of the 14th and 15th of September were spent in anticipation of a tank attack that threatened from the Calore River region to the North. The 2nd Battalion assisted in the repulsing of one tank attack across the Sele River while E Company, on a reconnaissance in force of the same area, encountered scattered and small elements of the enemy. The regimental recon platoon patrolled the area several miles to the front and battalions also sent out reconnaissance and combat patrols of their own with particular emphasis on the Altavilla sector. Hostile artillery fire was spasmodic and largely interdictory in character. Air activity was confined principally to friendly craft, though the enemy in groups of two and three would occasionally make an appearance over 504th positions only to be driven off by intense fire from supporting anti-aircraft units. On the morning of the 16th, the regiment marched four miles to occupy the town of Albanella, where at noon, Colonel Tucker issued to the battalion commanders the order to seize and hold the high ground surmounting Altavilla. The area in the region of Altavilla for several years had been a firing range for a German artillery school; consequently there was no problem of range, deflection, or prepared concentrations that the enemy had not solved long before the advent of the Americans. Needless to say, hostile artillery and mortar fire was extremely accurate and capable of pinpointing with lethal concentrations such vital features as wells, trails, and draws. During the three days that the 504th occupied the several hills behind Altavilla, approximately 30 paratroopers died, 150 were wounded, and one man was missing in action. The days that followed were, in the words of General Mark Clark, Commander of the 5th Army, "responsible for saving the Salerno beachhead." They included repelling tank attacks and small enemy forces. As the 504th took the high ground at Altavilla, the enemy counterattacked, and on the night of the 17th, it became evident that help had to be secured if the 504th, now completely cut off from friendly forces, was to hold these key positions so necessary for the security of the beachhead. The Commander of 6th Corps, General Dawley, suggested the unit withdraw. Epitomizing the determined spirit of the Regiment, Colonel Tucker vehemently replied, "Retreat, Hell! -- Send me my other battalion!" The 3rd Battalion then rejoined the 504th, the enemy was repulsed, and the Salerno beachhead was saved. This, the first contact with the enemy for men of the 504th since Sicily and the first time that the regiment had been committed as a unit in any single tactical operation, was a battle that turned the tide of the German onslaught on the Salerno beachhead and frustrated their attempts to contain the Fifth Army within the confines of the coastal plain reaching as far as Altavilla. On 1 October 1943, the 504th became the first infantry unit to enter Naples and 3rd Battalion became the first US parachute unit to receive a Presidential Unit Citation as a result of the fierce fighting. American parachutists...devils in baggy pants...are less than 100 meters from my outpost line. I can't sleep at night; they pop up from nowhere and we never know when or how they will strike next. Seems like the black-hearted devils are everywhere... To this day the paratroopers of the 504th PIR are still known as “The Devils”. 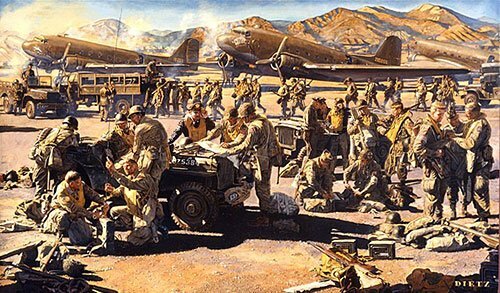 Eight Hours to Glory - Tucker’s Devils prepare to save the Salerno Beachhead, is dedicated in commemoration of the 60th Anniversary of the designation of the 82nd as an Airborne Division and in honor of the World War II Devil veterans and heroes who undertook this mission, which is still regarded as history’s greatest example of the mobility of the airborne paratroopers.